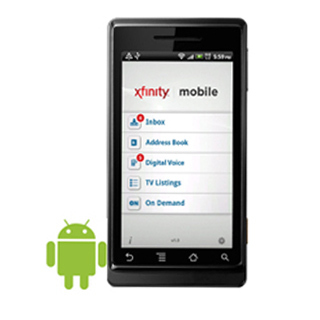 Android phone and tablet owners are rising in numbers, and those who subscribe to Comcast can now get hold of the Xfinity Android mobile App. Users get all kinds of useful stuff, such as email retrieval, DVR settings, voicemail, TV listings and more. But no mobile streaming yet! Following in the footsteps of it’s iPhone Xfinity app cousin, the Android version allows users to check the tv listings and schedule recordings on their DVR. The free to download app also offers access to other Comcast services like VoIP voicemail and Comcast’s email service. The app can run on any phone running Android 1.6 or above and can be downloaded by any user so long as they have a Googlemail account from the Android Market. The Xfinity TV service is an online option for all Comcast subscribers, and an effort to compete against the influx of internet TV services from companies such as Apple, Netflix and Google TV. The service makes available to stream around 150,000 TV shows and movies. The app also lets users re-route phone calls from the home phone to mobile when not at home. The bad news though is that because this is not an Xfinity TV app, the app does not include any streaming services. A bit of a big omission for a cable subscriber on the move, however Comcast have promised that future updates will enable streaming of TV and movies. Hey guys if you don’t want to wait for Comcast to release this Technology (date unknown) take a look at DISH Network. I am an employee and a subscriber, and our system is already up and running allowing people to access DVR, Stream Live thousands of shown and movies, access the internet and take it with you on the go. Not only Android, but also PC and iPad!! Go to Dish.com/TVEverywhere to get started. I DROPPED Dish after having it for 7 years, was not pleased they charged me 110+$ one time fee even so for cancelling and almost 20$ fee for shipping hd dvr back to them … lovely , glad to go, now have ROKU3 and over 1,000 channels with 35MBPS connection it’s fabulous, cianara DISH!! !